The appendix dangles from the colon on the right side of the abdomen. If its inner lining becomes inflamed and fills with pus, it may rupture and infect the rest of the abdominal cavity. Ruptured appendices can result in infections, complications, extended hospital stays, and even death. 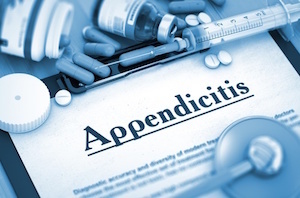 One in 15 people get appendicitis during their lifetimes, but our Chicago appendicitis malpractice attorneys know that it is a commonly missed medical diagnosis, and sometimes even when caught it is not treated appropriately. A doctor's failure to treat appendicitis can result in serious injuries or even death. At Moll Law Group, our medical malpractice attorneys are available to evaluate the circumstances and medical records, consult experts, and represent you in a lawsuit for compensation when appropriate. Billions of dollars have been recovered in cases in which we have been involved. A failure to diagnose and treat appendicitis can result in a ruptured appendix. Classic symptoms that a doctor should be able to diagnose include general abdominal discomfort, nausea, pain in the right lower abdomen, fever, vomiting, and loss of appetite over a 24-hour period. About half of patients with appendicitis do not present with all of these classic symptoms. Methods of diagnosis include blood tests, urine tests, imaging tests, and physical examinations. A failure to diagnose can happen when there is a failure to order the appropriate tests, a failure to give an adequate physical exam, inadequate follow-up, or a failure to ask the right questions. CT scans sometimes fail as well, which can lead to an unnecessary operation or increase the risk of abdominal cancer. An appendix can rupture within 24 hours after symptoms start. If a diagnosis is made, the appropriate course of treatment is almost always to remove the appendix with surgery. There are some cases in which the appendix is managed without an operation. Not all ruptured appendices indicate that there has been medical malpractice. Our appendicitis malpractice lawyers can advise Chicago patients on whether they may have a claim. In some cases, the appendicitis presented too unusually to be caught or was on the verge of a rupture that could not be stopped in time. In Illinois, a plaintiff needs to obtain a certificate of merit from an expert in the same field as the defendant. This certificate will specify what the doctor did wrong and provide an opinion that there is a meritorious basis to the plaintiff's claim. At trial, the plaintiff needs to prove that the defendant's conduct fell below the applicable standard of care and that this breach of care caused his or her injuries. In a wrongful death case, the plaintiff needs to establish that the breach of care caused the patient's death. Generally, it is necessary to present experts to testify on issues related to standard of care and causation. The standard of care may vary depending on a patient's medical history and age. If your doctor failed to properly treat your appendicitis, the Chicago appendicitis malpractice lawyers at Moll Law Group are available to help you bring a lawsuit to pursue economic and noneconomic compensation. We are also available to help families pursue compensation for a wrongful death due to a failure to treat appendicitis. Our firm represents injured individuals in Naperville, Wheaton, Schaumburg, and communities throughout Cook County. Call us at 312-462-1700 or complete our online form to schedule a free consultation with an injury attorney.